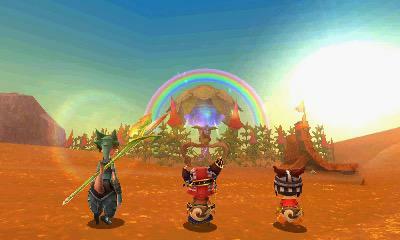 Nintendo has introduced a brand new IP to its long-running stable of 3DS RPGs, and it's got a very simple name: Ever Oasis. It comes to us from Grezzo Co., Ltd., which is (according to Nintendo) the team who brought us The Legend of Zelda: Majora's Mask 3D and follows a character known as a "Seedling" whose purpose is to build an oasis by working in tandem with your partner Isuna. It's your job to fight the Chaos encroaching on the peaceful desert in which you make your home. You'll take advantage of real-time combat and three party members at your disposal while heading across the desert, while checkingout various caves and dungeons to collect dewadems. You'll need those precious dewadems if you want to create new shops or gear, so exploration is absolutely crucial. The world looks like a fairly wide one to explore, inspired by Egyptian culture and mythology. You'll be creating special Bloom Booths over the entire overworld as you pick up new villagers who bring their own special shops, weapons and abilities as well. This looks like an interesting departure for Nintendo, especially since there aren't often new IPs around to take chances. Check out your first real look at the game below!